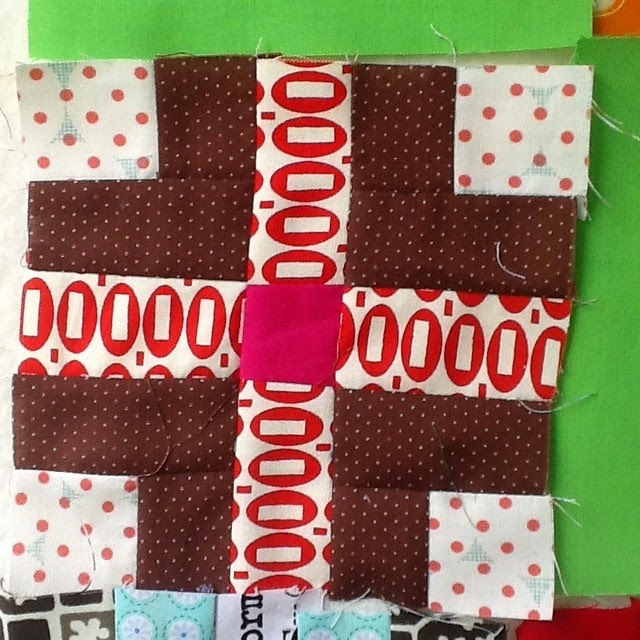 Hot Cross Buns on Scraptastic Tuesday! Sorry we are on holiday here and I forgot it was Tuesday! Oops! 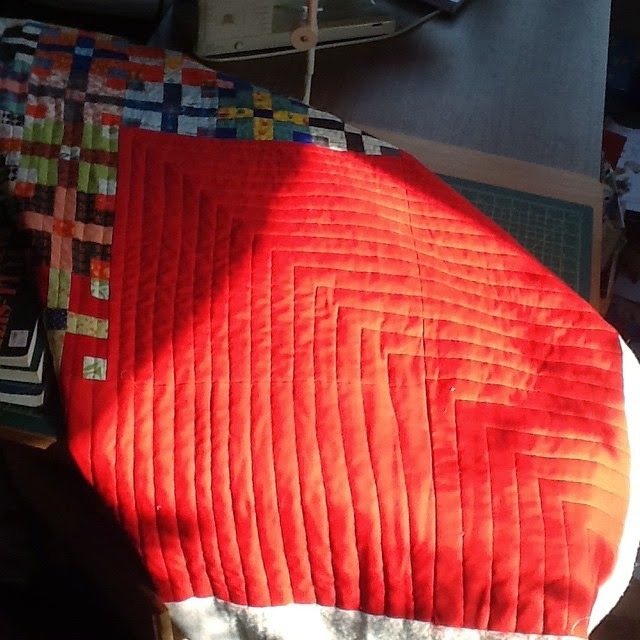 I started quilting the red quilt yesterday! This was the plan of how it should look! 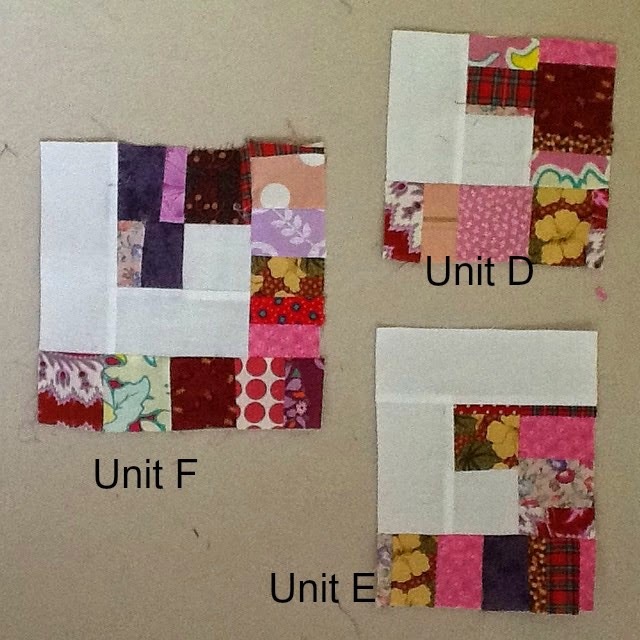 The little blocks are a design I found on Bonnie Hunter's blog Quiltville, called Hot Cross Bun. 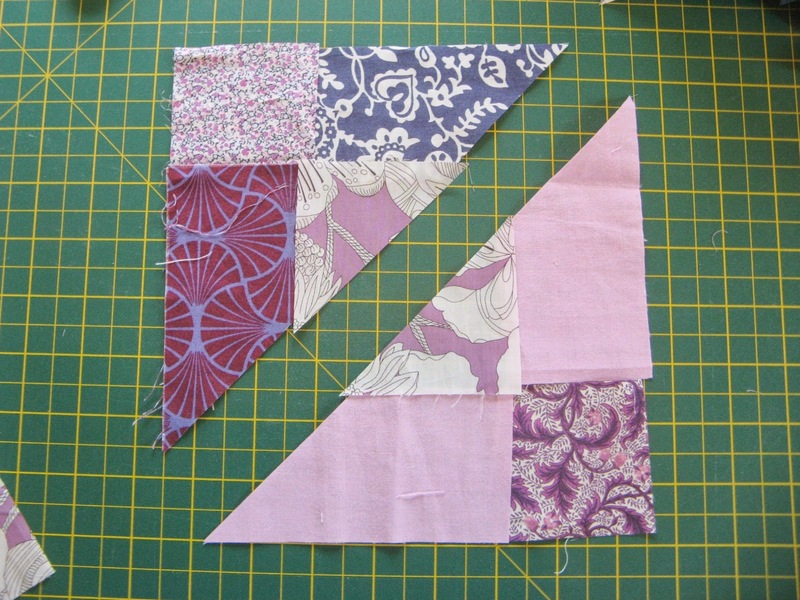 I thought I could use up lots of scraps making a quilt full of these blocks - but I've actually split them up with some solids and am making three! 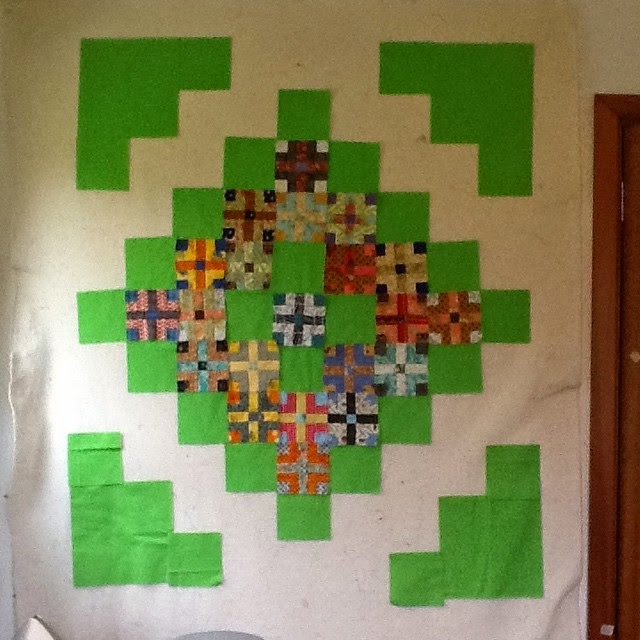 This was how my first quilt top grew on my design wall! 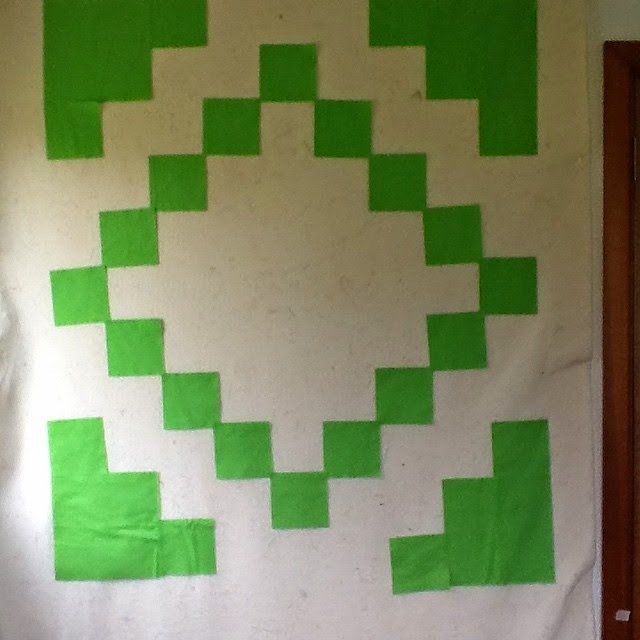 I had been thinking how to quilt this one for a while and decided to go for a sort of organic straight line L shaped quilting! This was the one quarter I got done yesterday! 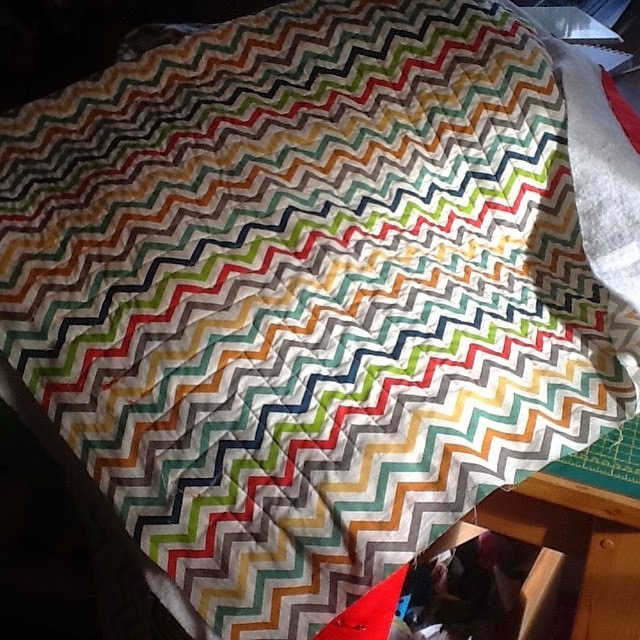 This is what I have backed it with....an organic zigzag from Birch Fabrics. 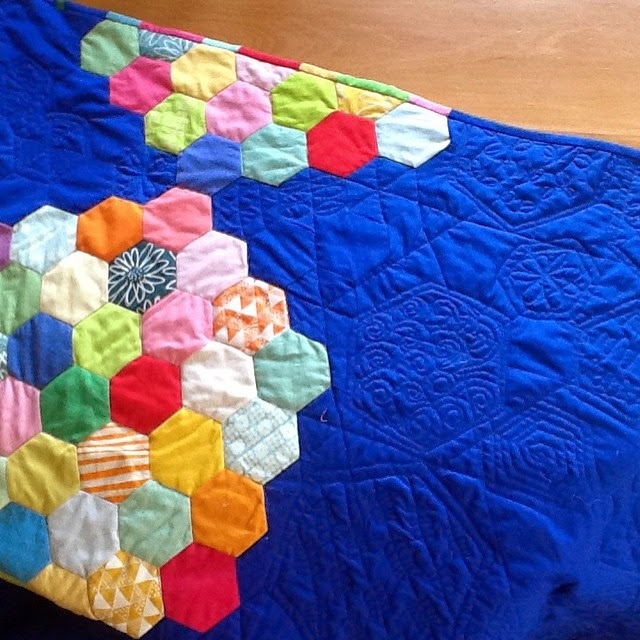 Love how the quilting works with the design. In fact it does look pretty much like my plan - who would have thought it!? 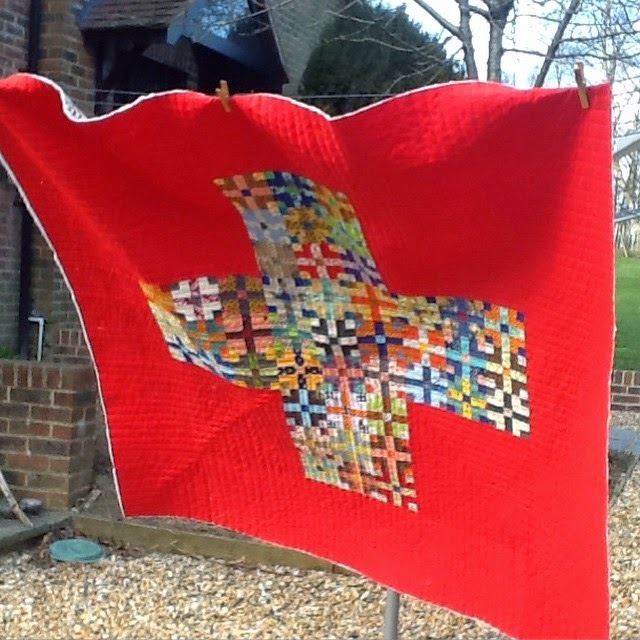 Just got a self coloured binding to add and this will be added to my pile for Siblings Together...we are looking for 100 quilts this year so if you have a few to spare just let me know! 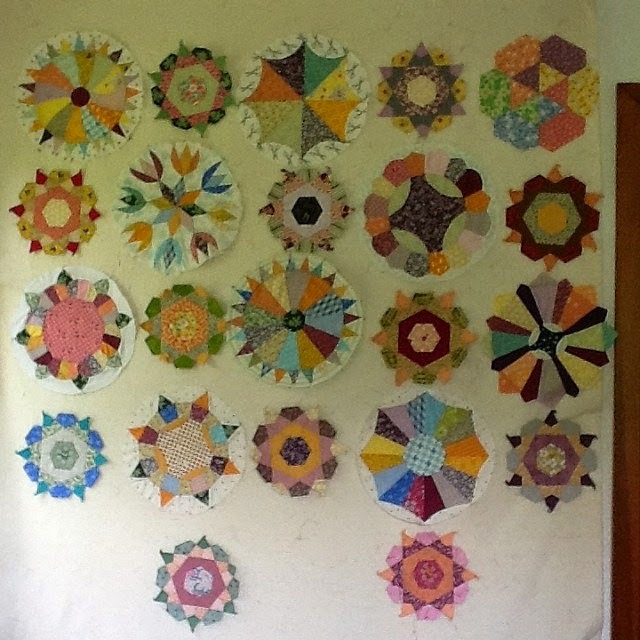 I started Big Hexy Balls in August 2013. 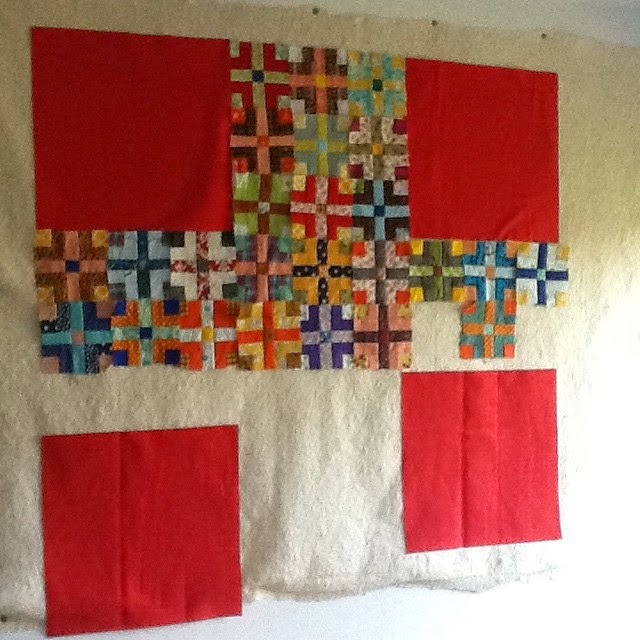 I was working on it again at the beginning of the month - unpicking some bad quilting and quilting it up differently. It went well and I thought I had finished it - or maybe not! I sat on it for a while and then I just decided it was finished and I should bind it after all. It was fiddly but I think it worked well enough. 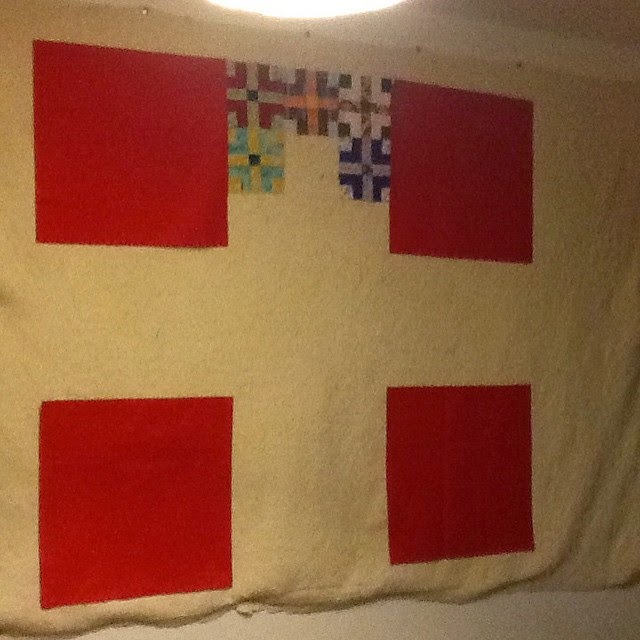 It adds another bit of interest to a fairly minimalist quilt. I was all set to finish off the binding by hand but I just thought how boring that would be. So I finished it off by top stitching it on the machine. My scrappy spiral or greek key quilt is finished! I'm calling it Marmalade Swirl. 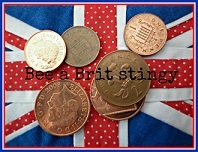 It will be sent to the fabulous charity Siblings Together to give some child in the UK care system a hug! 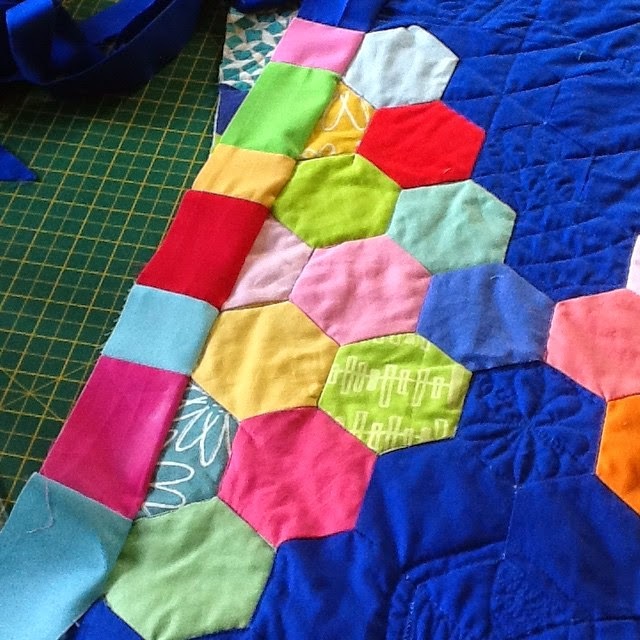 I found inspiration for this quilt from Karen Griska's quilt Yellow Brick Road. 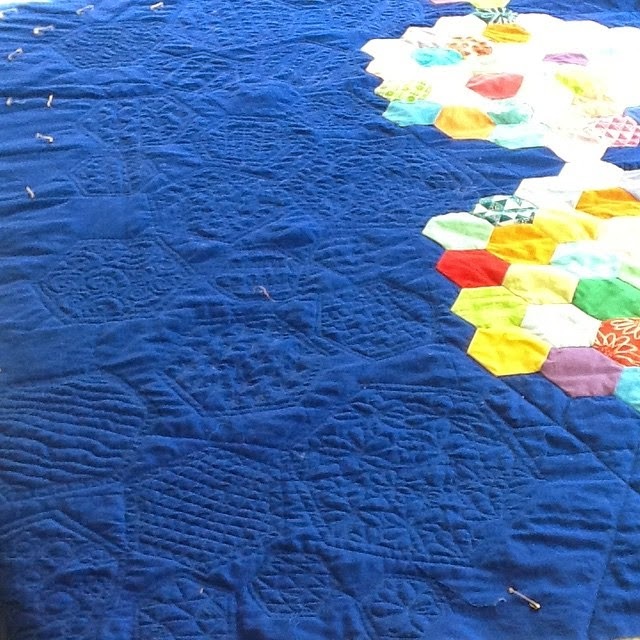 Karen's quilt keeps on spiralling on - it is after all a road leading all the way to Oz! 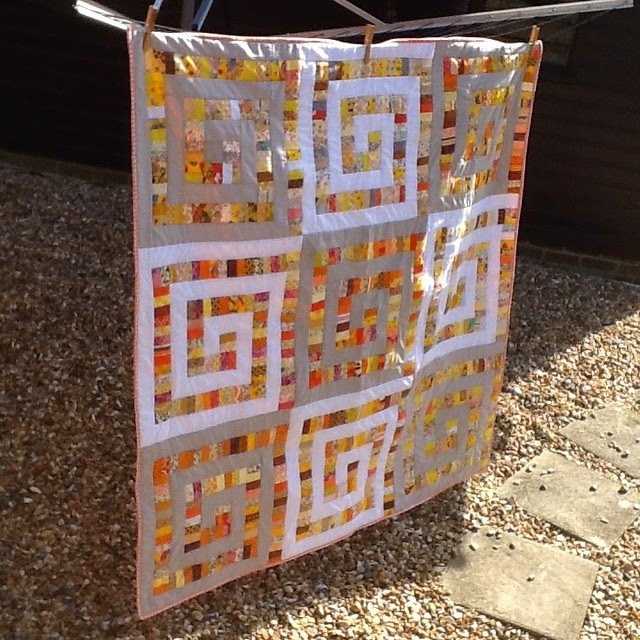 With Marmalade Swirl I stopped my block at 20" square (finished size) after a comment from the lovely SewMeSarah! She is ever so helpful. I was wondering how I could continue anyway as my supply of that white fabric was running out so switching to a different background fabric seemed like the answer! Ash was my second background choice. 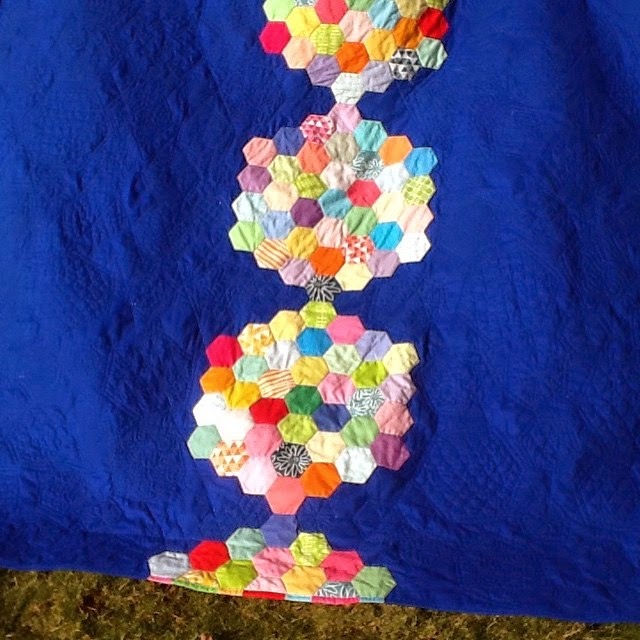 I love the effect of this quilt and how much scrap I can bury in it - believe me they are not all beautiful fabrics! Since completing it have been imagining other colourways! Well it doesn't take much to make me misbehave so after a request for a tutorial on IG I succumbed into diving into my red stash and started Raspberry Ripple! In Marmalade Swirl I carefully cut my oranges and yellows into 2 1/2" x 1 1/2" strips but that was tedious I have to say. So this time I decided to add any size of scrap as long as they were 2 1/2" in one direction. 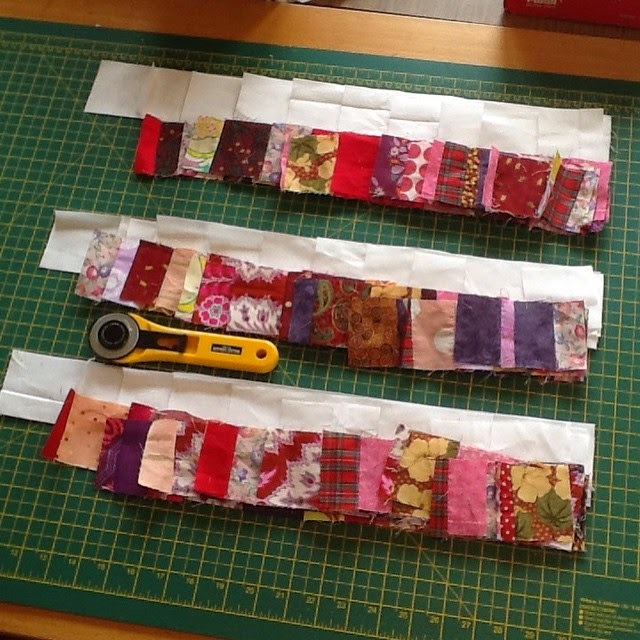 I stitched my scraps into long rolls, using them as leader enders while making bee blocks. Then this morning I just got stuck in and stitched! Here is the result! A whole lot of Raspberry rippling over my cutting table. 2 1/2", 4 1/2", 6 1/2"....rising in 2" increments till you get to 18 1/2"
Repeat with the background fabric but also cut a strip 20 1/2" long. Join the scrap 2 1/2" piece to the background 2 1/2" piece (Unit A). With the scrap 2 1/2" square at the top of Unit A join the background 4 1/2" piece to the left (Unit B) and add the scrap 4 1/2" piece to the right (Unit C). Continue to add the scrap and background pieces in increasing length following each spiral round the block. If your next background piece is too long then you need to add a scrap one or vice versa! 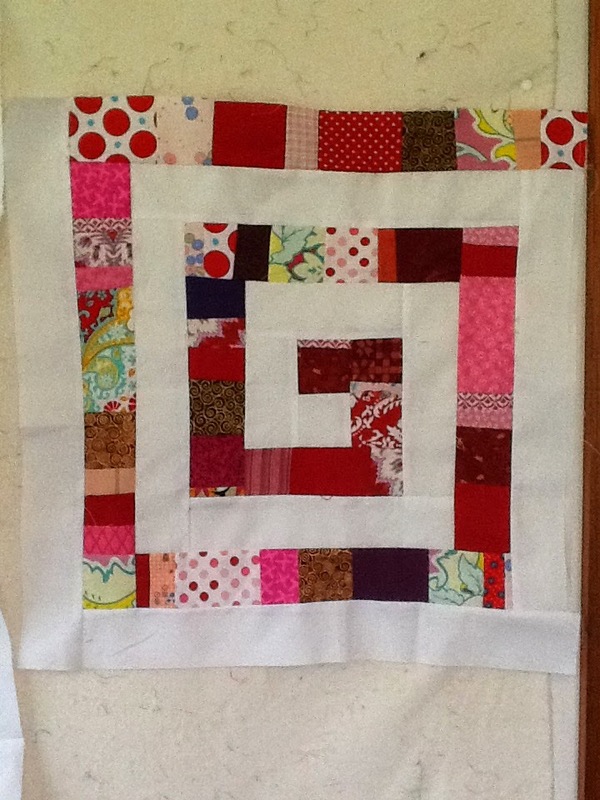 Keep going till all the pieces are used up and add the final 20 1/2" background strip to square up your block. 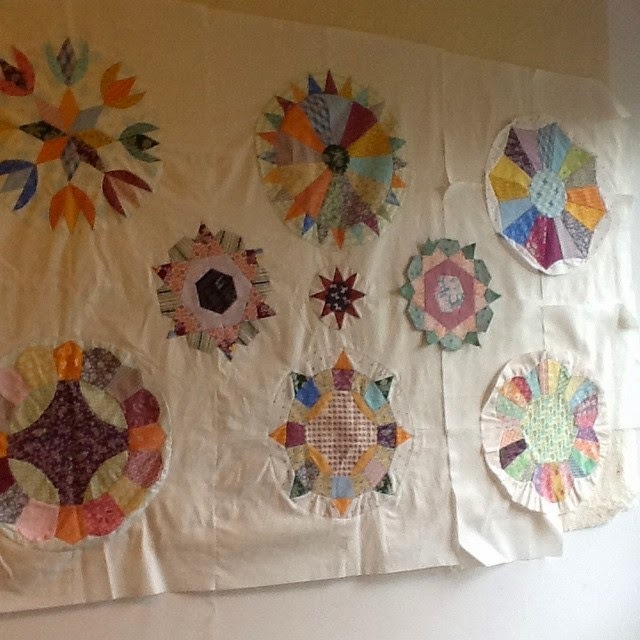 My blocks all spiral round in a clockwise fashion from the centre. I am left handed and you may find it easier to spiral anti-clockwise - just avoid doing both in the same block! Also keep your blocks going the same way unless of course you want a mixture ......now there's an idea! I am hoping to deplete my scrap boxes and add Blueberry Pie (blue/purple) , Mint Julep (green/aqua) and Plum Duff (purple/black) versions if I find the time and energy to do so. 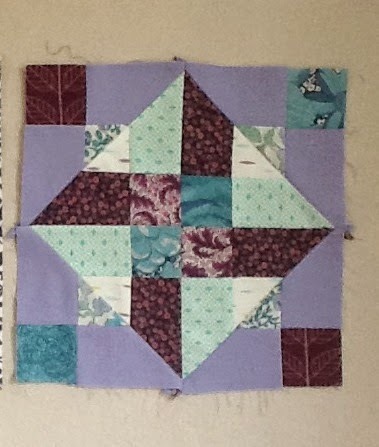 Hope you have fun with this block and do let me know if you make blocks or a quilt as I'd love to see your variation! Edited to add background fabric requirements: For each block you will need three 2.5" strips WOF so 7.5". 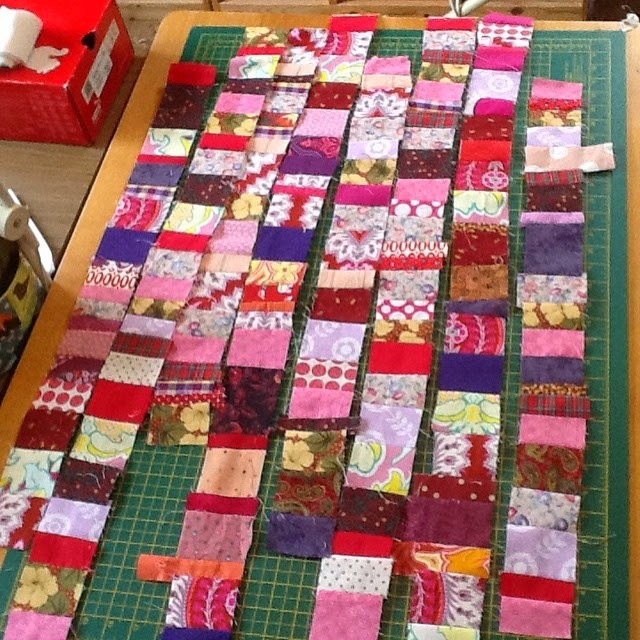 For four blocks you will need 30" and for five 37.5" - both within a one metre length of fabric! The last of the Hot Cross Bun quilt tops is finished! Must say making those little blocks in a hurry is not so much fun! Think I preferred as I started out, taking my time selecting the right scraps. They have been a fun way to try out different colour schemes; working out how to make some blocks pop and others recede. Great learning tool if you like. 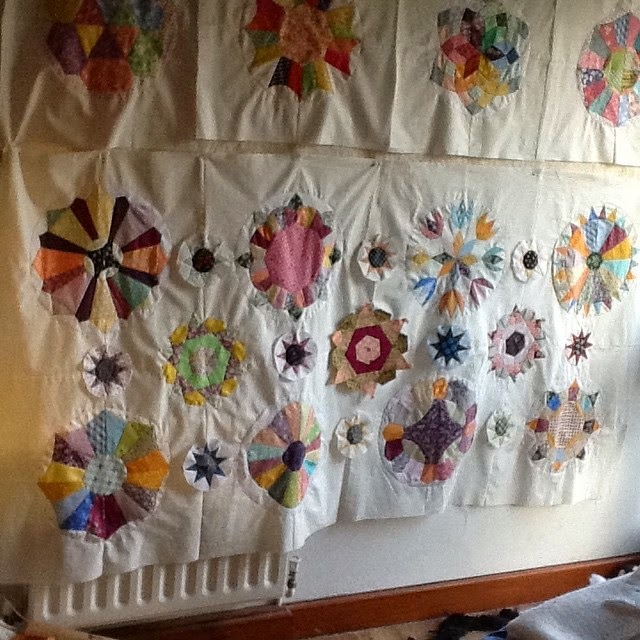 Then it was just a matter of trying not to have too many repeated fabrics close to each other - in fact if you do have repeats, spreading them around the quilt top does make your eye wander all the way around! It's a bit like Where's Wally! And here they are all three! Which one do you like best!? 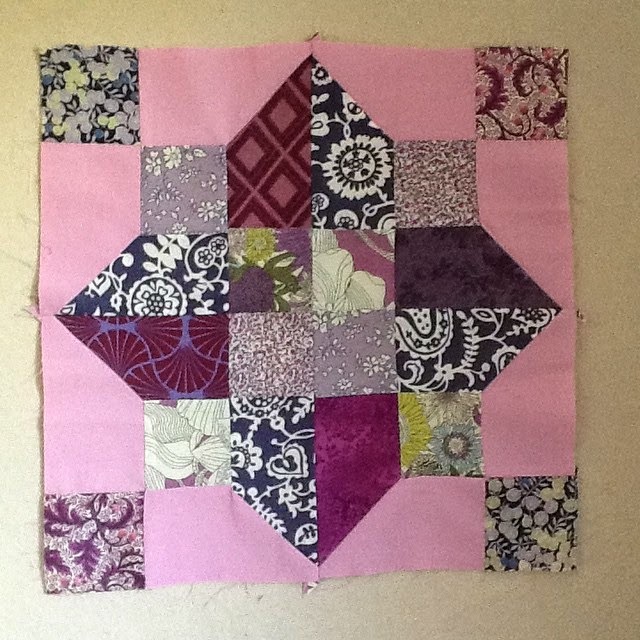 Thanks to Bonnie Hunter for the inspiration with this little block. 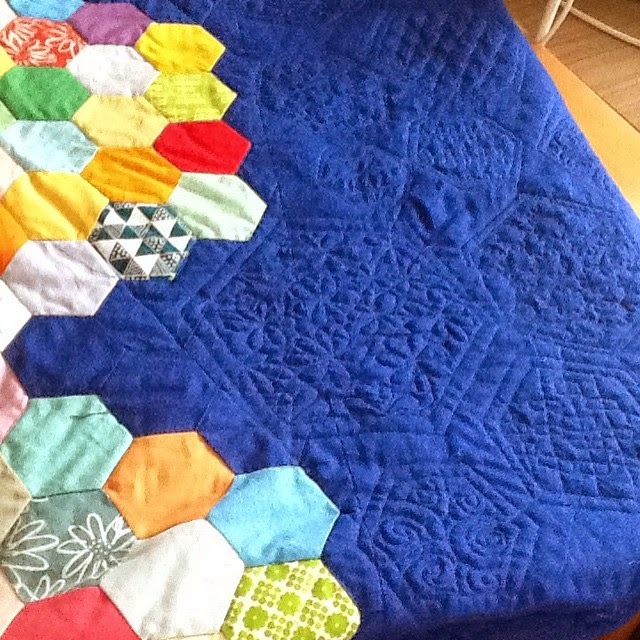 You can see her quilt on the cover of Quiltmaker May/June 2015 or on her blog here. 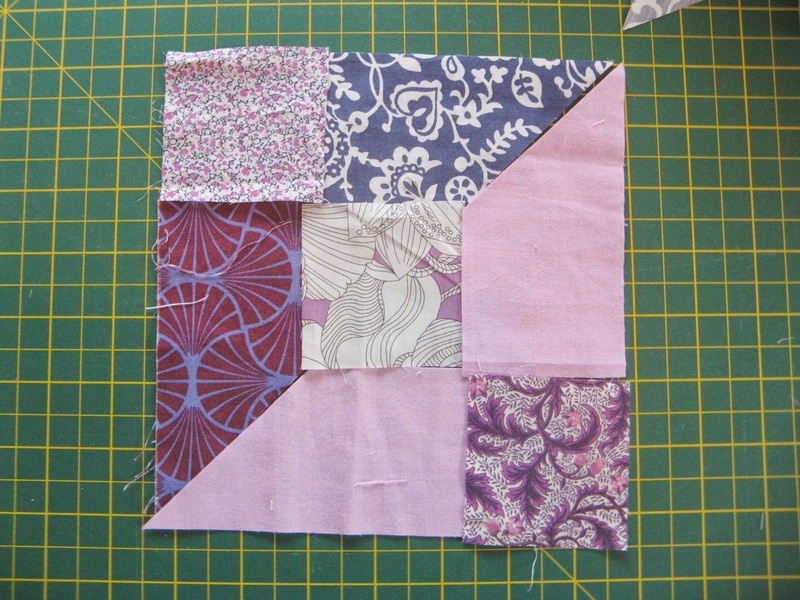 Oh dear - she has another block I'd like to play with....oh well I have plenty of scraps! 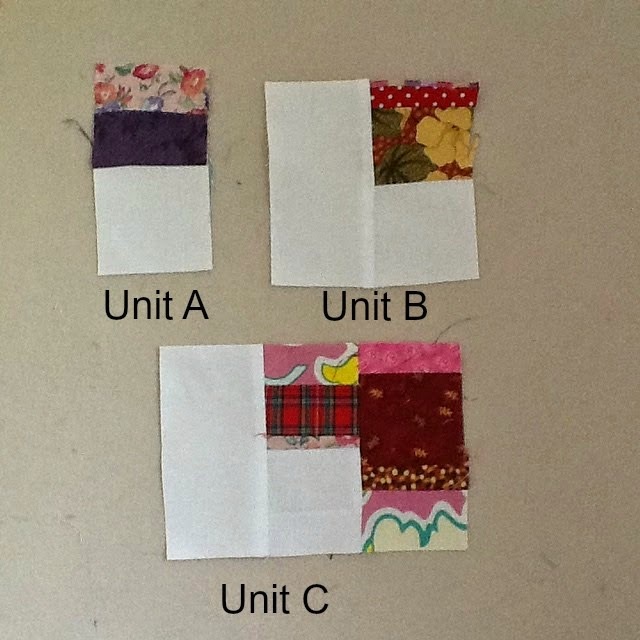 Now I just need to get busy layering, basting, quilting and binding these three quilt tops! Scraptastic Tuesday and I've been working hard! I am planning new things .....(secretly I always am)! But I have committed to finishing off old projects or UFOs first! My rule is that anything from last year is a UFO and anything started this year is not! and also I wanted the wall space (to be honest). So I have finished the blocks I planned. 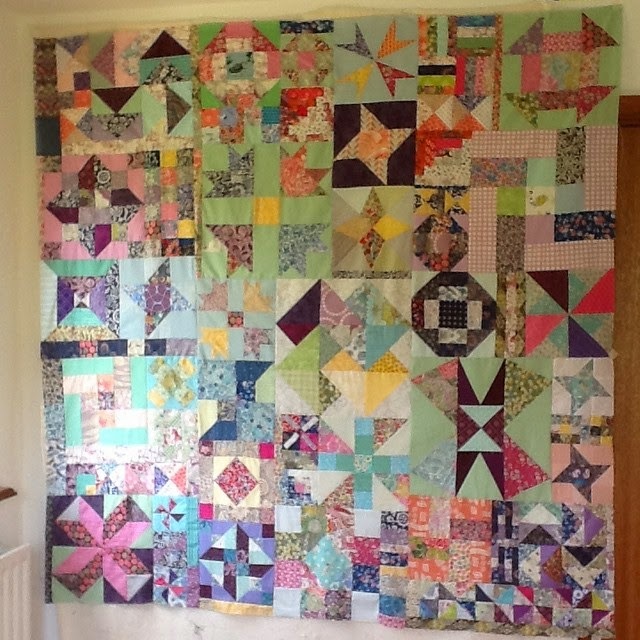 And here is a photo of the quilt top! Some blocks got moved around and gaps were filled in with filler strips and such! I have still got to write up those tutorials but have been concentrating on the stitching first! Not sure if it is quite finished yet...? What do you think? It might need a border of sorts to help pull the chaos together....your comments are welcome! 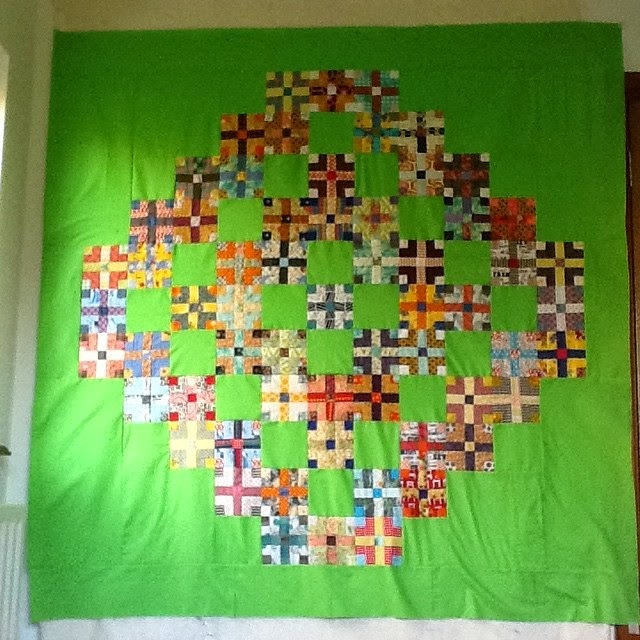 Anyway I wanted the wall space so I could work on the third hot cross bun quilt that I am making for the fabulous charity #siblingstogether. Then on Monday I filled in the rest - staying up late to do so! Then I spotted that I had added two extra rows so now I need 6 more blocks to finish it! 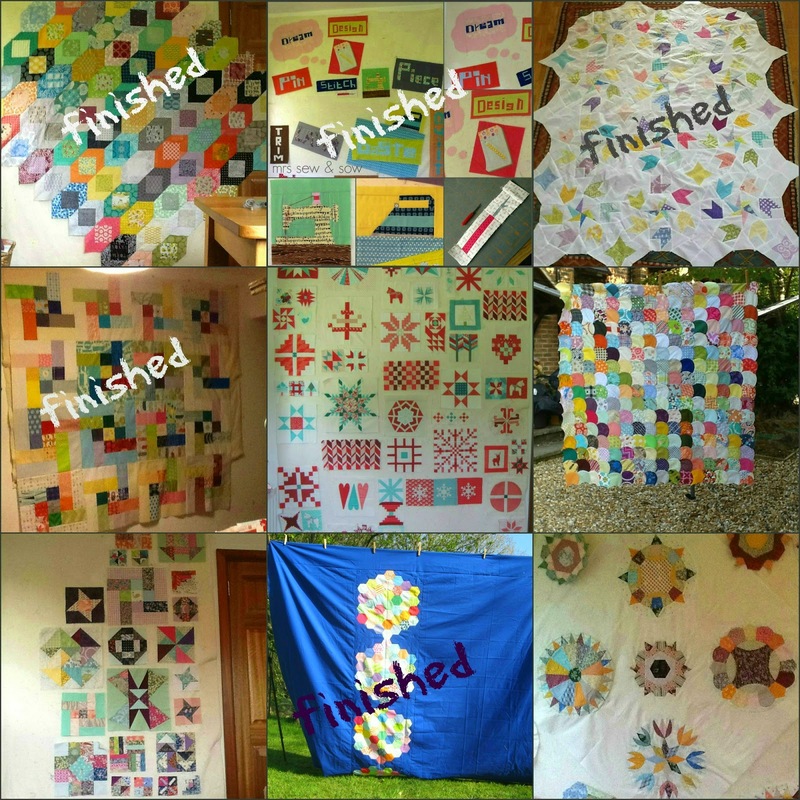 Six more after making 149 (in the three quilts). Slightly less addicted to making them now I have to say but that is because it has become a bit of a mechanical process rather than the leisurely enjoyable one of choosing fabric combinations that I love! I must say that scraps have helped me appreciate colour and value and their effects more. 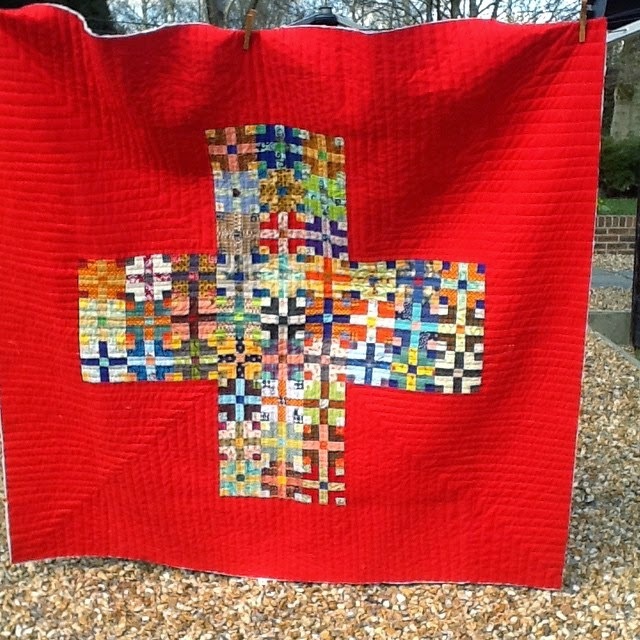 Not that you seem to be able to make mistakes in a scrap quilt - it seems to me that anything goes! Love this one - I was thinking Black Forest gateau at the time! Slightly wonky late night stitching then or maybe too much Kirsch? A week has shot past - just where did it go!? 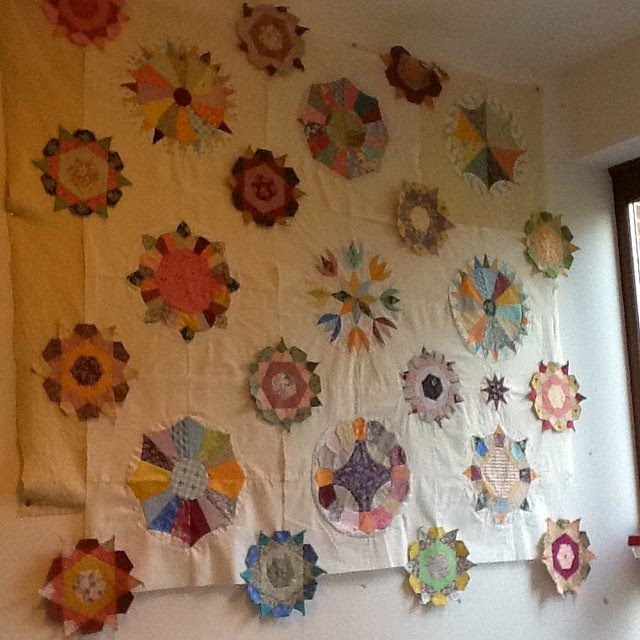 And I have also made a bit of progress on my scraptastic sampler quilt. 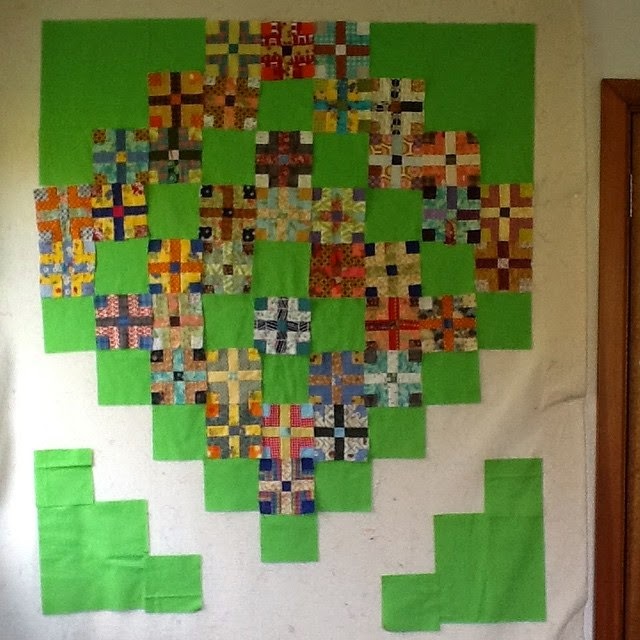 The last thing I mentioned on that quilt was putting together a block called Lucky Clover - I hadn't quite got my block together. Here is the 12" version with y seams! And here is the 9" version without y seams! I have photos of both methods to show you if you want to make some and will write up a little photo tutorial in due course. 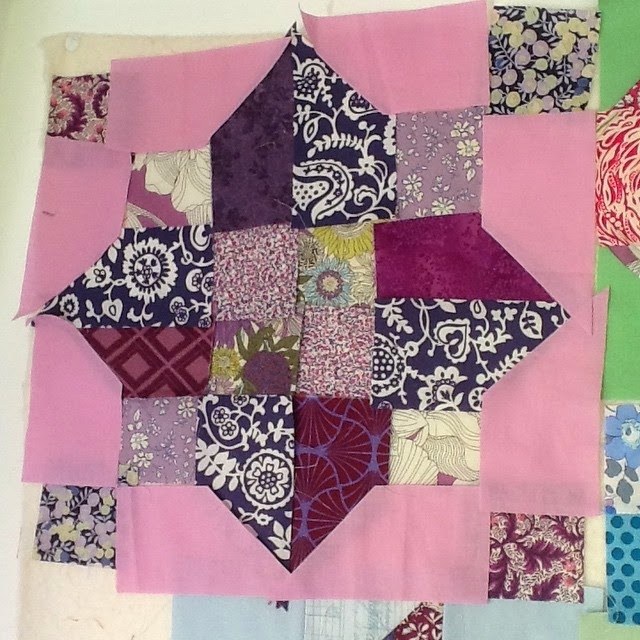 I think you could have a lot of fun with this block and wouldn't a quilt of them look great! I'm going to have to play with this block some more even if it is only on EQ! But now to the important business. It's time to award the March link prizes. If you are a winner, watch for Leanne's email later today or feel free to contact her first. A huge thank you to our generous sponsors for providing our wonderful prizes! 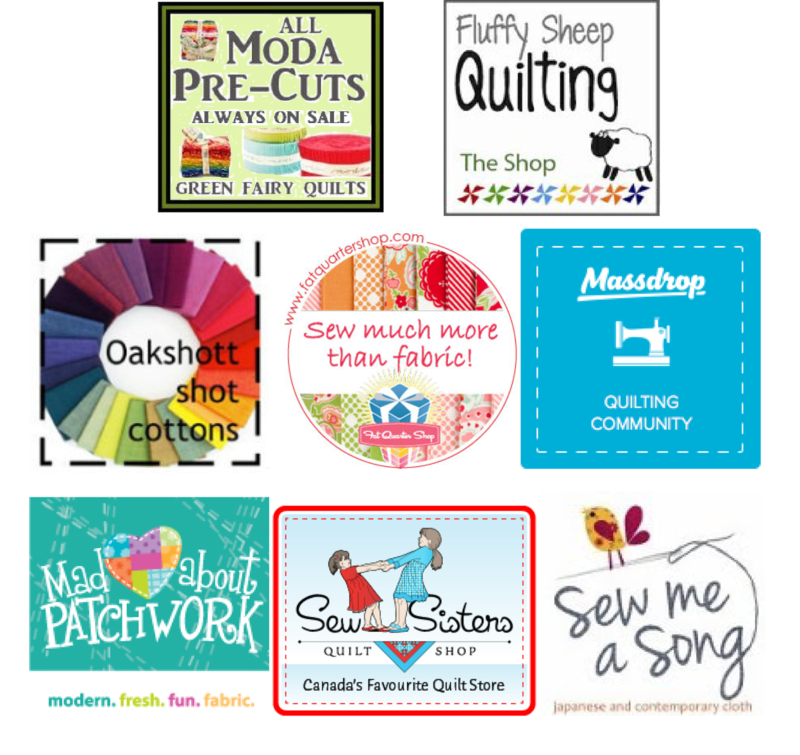 Our next Scraptastic Tuesday link will the second Tuesday in April, which is April 14, 2015 - please plan to link up with us again then. 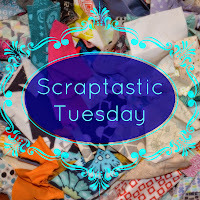 Scraptastic Tuesday - March Linkup! It is the mad month of March here and my kid are full of germs! Trying to look after them but not inhale! I DO NOT want their colds thank you. But we are not here to discuss that are we!? I do so want to see what scrappiness you have been up to! As for myself, I have been working on my oldest UFO trying to finish the top and I have been getting closer. 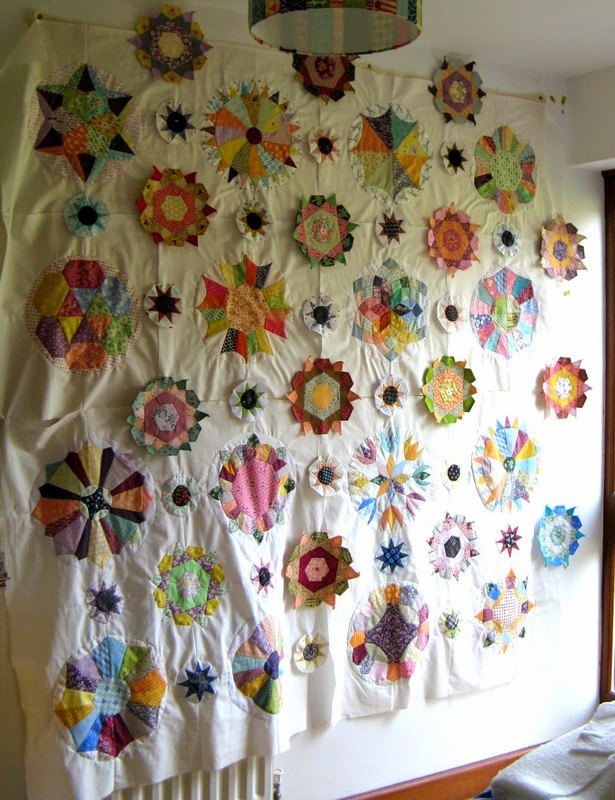 Where I left it last year - combining two different projects as I was a bit bored with the EPP Rosestars ! 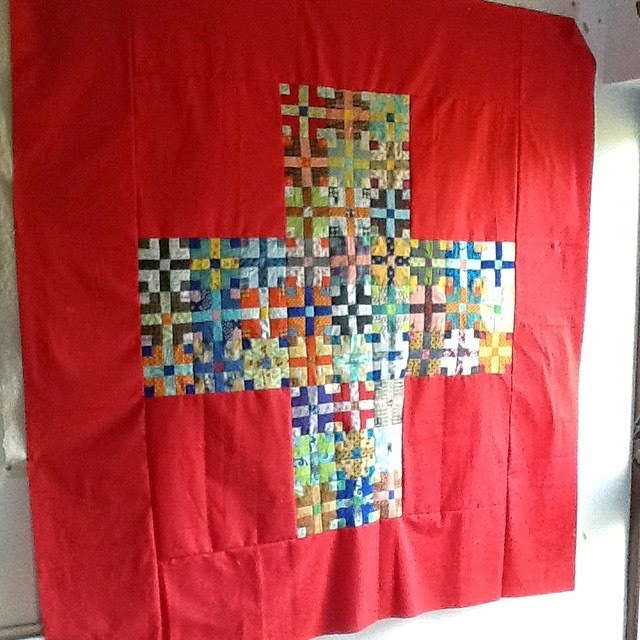 Too repetitive for me - I have no patience and was never going to complete the quilt! My pieced blocks are more spaced out on the background and I'm doing a bit of hand applique to stitch those EPP Rosestar blocks over the intersections. 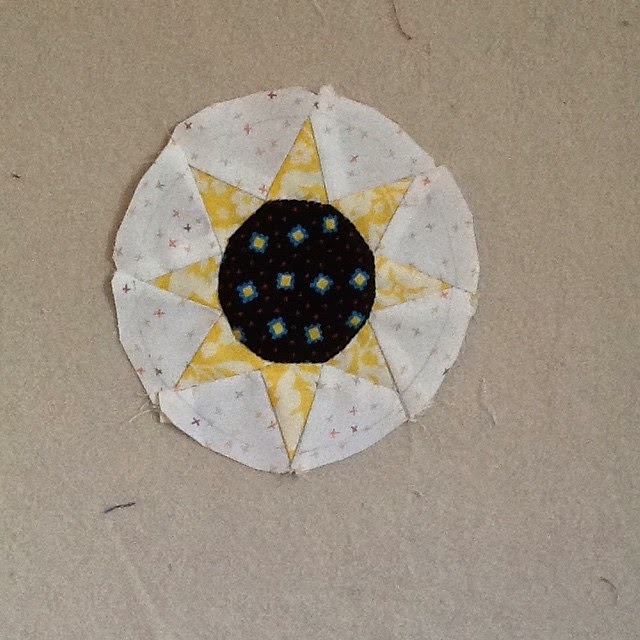 I am adding the star centres from Jen Kingwell's pattern : Georgetown on my Mind! I was wondering about her sanity as there are 38 of these in her pattern but having made a few I am now an addict! And how is this scrappy ? Well some is made from stash I will confess but every chance I see I grab a bit from my scrap bins and have done so throughout this project. It certainly has a scrappy vibe to it! 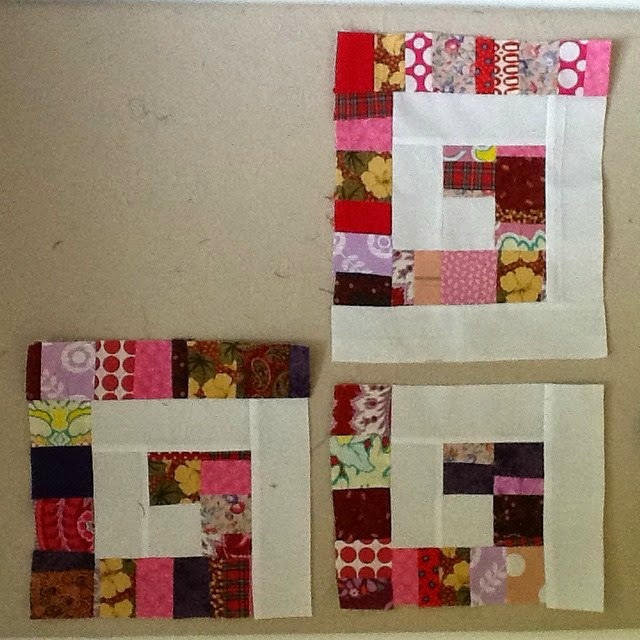 I am even thinking of starting a new project with these cute little blocks but totally scrappy! Hmmm do you think I should? One link per person, and it will be your entry into the random draw for the prizes. 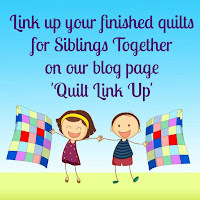 It is the same link up here and at Leanne's blog She Can Quilt - so you only need to link up on one of our blogs. First of all hats off to our friends providing the prizes! As for Leanne, she has been en route a lot and has not been up to much scrappiness but she is looking for inspiration! I'm sure everyone can bring a bit of that! Scraptastic Tuesday - Lucky Clover! I'm a bit behind with the making of this block but I'm loving the look of it! Here is my 12" version all cut up and ready to stitch! Lots of Liberty in here! So what do you need to cut out? Sixteen rectangles 2 1/2" x 4 7/8" - eight from background fabric. Take your background rectangles in pairs and face right side to right side. Cut a 45 degree angle from the end of each pair - this means you end up with mirrored pieces. Repeat for your feature fabric. This block looks great with different values for these feature pieces so make sure you pair your light/dark fabrics for cutting that angle ! Don't ask why I know! Now it seems to me that stitching up a quarter block will be the easiest way to put this together. Are you shrieking Y seams and partial seams at me??? You could avoid those quite easily by cutting that centre square in half - though it would then need to be cut from a 3" square to allow for that seam. Put together as for the 12" version. In the meantime I shall be scratching my head working out how I will put mine together. 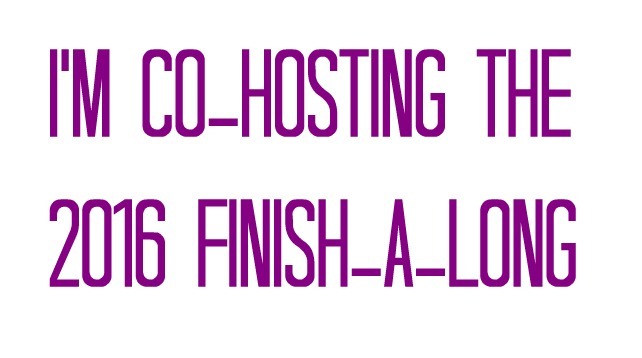 And please remember to link your scrappy projects NEXT TUESDAY 10 MARCH!